Click on the video to watch it (Runtime 6 minutes and 50 seconds). Have I mentioned that it’s my job to help trades business owners grow and scale? I’m a business coach for the trades businesses and builders, and I help you grow and scale and put systems and structure in place so that you can do that. 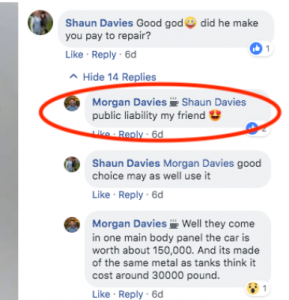 I saw a post on Carpenters Talk group on Facebook where a guy told an amusing and funny story about how he had an accident at work and damaged someone’s expensive car. He dropped a crowbar off some scaffolding onto a Bentley which caused £30,000 of damage to the car. I asked his permission to use this story. His name is Morgan. It’s a good example of the value that a well-structured trade business can bring to your customers. The upshot of the story is that despite taking reasonable precautions, an accident still happened. He was up on scaffolding, wasps came out when he crowbarred some timber off the fascia, made him jump, he tripped, the crowbar fell, bounced from the bottom of the scaffolding and hit the Bentley. A Bentley SUV worth a £150,000. The damage to be fixed to the paintwork and the bodywork was £30,000. 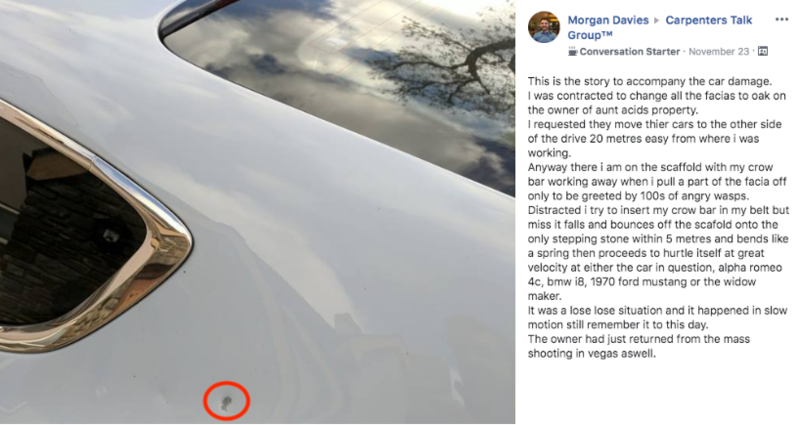 Luckily, Morgan had insurance — public liability insurance which paid out. So he paid his excess of £150,000 and everyone’s happy. 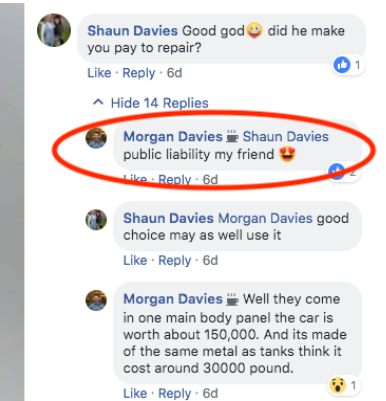 The car is fixed and the customer’s happy, Morgan can go on with the job. The lesson is to get public liability insurance. Accidents happen. We all know that accidents happen no matter how careful we are, no matter how many precautions we take, accidents can still happen. And anyone who tells you otherwise is a liar, they still happen — it’s a building site and it’s a dangerous place and stuff goes wrong. Morgan was protected and he did well to protect himself. But I think the real lesson is about how insurance protected the customer. The customer hired a building business that does it properly. He hired a building business that invested in the appropriate business liability insurance as well as taking the right precautions. Even though the accident happened, the car got fixed, everything went smoothly, the customer was protected, and this is what I want you to take home. Let’s think about what might have happened if the client had chosen a different building company and if he’d chosen one who didn’t do it properly. Perhaps, one who he didn’t have public liability insurance. Do you think his job would be finished? Recommended Reading: Tell People What Kind Of Trade You Are. Know Your Value Proposition. I think not. He’d probably be in court fighting to get his car repaired by someone who didn’t have insurance to pay £30,000, so he’d have to fund it himself, get the guy to admit liability and get him to pay up. If they were found liable in the small claims court they’d have to sell assets in the business or might have to wind the business up, so he’d probably still be going through a very sh*tty process. He’d still have a broken car, fighting to get his money out of the liable builder, and probably wouldn’t have a finished job because they’d have fallen out because of all this fighting. A terrible experience for the customer was prevented by the fact that Morgan had his business liability insurance and had done it properly. And that’s what I want you to think about. That’s what your clients are paying for when they pay the extra to get you. They’re getting things like the fact that you’re appropriately insured. I’m going to write more of these about the things that set you apart from the cheap guys — the back of the van trades. I know you’re frustrated because I see on Facebook that you’re all frustrated by the guys not doing it properly and it’s those guys that are a bigger risk to the customers. The point I want to make for you is your customer doesn’t know that you’re insured appropriately and the other guy is or isn’t so it’s up to you to point this stuff out. And as a business coach of a trade, that’s part of what we do. Part of our program is working out what value you bring to your customers. Mostly it’s about protecting them from misfortune and risk of things not going so well, and that’s really what I want you to get your head around with your customers. Point it out, run it home and make them compare you to the other people. Ask so they understand why you’re different and so they understand why you’re a lower risk. In my program, we’ll go through the process of figuring out why you’re different and better. Insurance is one of them. So, in my program that’s what we do. If you’re not, I can help you.